Danielle Blackbird introduces us to where to find Shakespeare in Stockholm. All photos courtesy of The Stockholm English Speaking Theatre. The cast would seem to agree. Undaunted by the heat, they will rehearse a scene until they get it right. “Let’s do it again!” is a cry frequently heard as actors spring into their places. Outdoor summer Shakespeare is already a popular event in many cities and would seem to be a perfect fit for Stockholm, where locals soak up as many rays as possible in the warm months and flock to outdoor performances such as Allsång and Kulturfestival. Two years ago SEST’s Shakespeare montage As We Like It attracted 1,000 spectators a night. Stockholm English Speaking Theatre was formed to fill that gap. 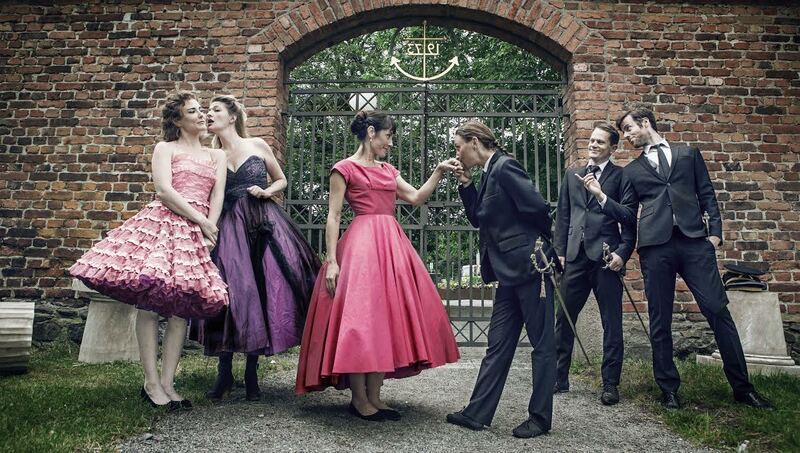 The original company members crossed paths in 2010 and are now producing their seventh play together, Much Ado about Nothing, which will be performed on Djurgården and the grounds of Drottningholm palace this summer. The ensemble of professional actors hails from the U.K., Ireland, and Sweden. Many theatre companies choose to focus on a particular acting style or genre of play, but SEST welcomes variety. Their guiding principles are collaboration and how best to tell the story, be it classical or modern. With Much Ado about Nothing, they have chosen to explore the play’s cultural environment in Sicily. When Shakespeare set his play in Messina, a port city on the island’s northeastern tip, he may simply have chosen a place name which sounded exotic and impressive. But the SEST company has discovered that the Italian backdrop can highlight important themes in the play. “It’s all about honor culture,” says Ingela Lundh. This production of Much Ado is updated to the 1960s, but a powerful traditional morality still holds sway in Sicily. When a young woman, Hero, is accused of being unfaithful the night before her wedding, it is a catastrophe for her whole family. As in many of Shakespeare’s comedies, the plot is driven by some very dark events, yet the overall tone is light and playful. We have, in addition to the troubled story of Hero and her fiancé Claudio, the more hilarious affair of Beatrice and Benedick, a couple who have sworn never to marry although they are obviously crazy for each other. In the end, it is the most foolish characters who discover the truth and save the day, turning catastrophe into celebration. Shakespeare frequently writes songs into his plays, and Much Ado is no exception. For this production, Shakespeare’s words have been set to original music by Chris Killik, who also plays Benedick. The soundscape further includes North African folk music, representing another cultural layer found in Sicily, and radio pop songs from the 1960s. This is a Sicily caught between domineering tradition and rebellious modernity. That kind of tension can be oppressive but can also be very funny. SEST’s Much Ado takes a wide open approach to performance. There is no “fourth wall” – the illusion that the audience does not exist in the world of the play. Actors will freely address lines to the crowd; Shakespeare is, in fact, written to be performed this way. Further, the audience is not asked to suspend disbelief and forget that the people they watch are actually performers: simple costume changes happen in full view, and when not onstage, the actors can be seen lounging on the sidelines in beach chairs. Every member of the six-person cast plays multiple roles, with women frequently taking roles scripted for men. Sometimes the character is changed to become female, sometimes not. We accept that for the time this person is on stage, they are exactly who they say they are. No further illusion is needed. With so many English-speaking visitors and residents of Stockholm, including a majority who are essentially fluent in English as a second language, there is no doubt that English-language theatre could be a vital force in the cultural life here. Stockholm English Speaking Theatre shows the abundance of creative energy and professional skill which should allow them to play a major role in that cultural life. Come and meet them this month, as for a short time the Swedish summer turns Sicilian. Danielle Blackbird is a theatre artist and woman-of-letters currently making her home in Stockholm. With equal passions for history, language, and the arts, Danielle is constantly exploring ways to create great art informed by scholarship and great scholarship informed by art. Favorite Swedish places include Drottningholm Slottsteater, Carolina Rediviva library in Uppsala, and the Medieval ruins of Sigtuna and Visby. You can read Danielle's occasional musings on her blog.